Veterinary Assisting | Stellar Career College | Modesto, CA. Turn your passion for animals into a fulfilling career! Veterinary assistants are the ‘jack of all trades’ in the veterinary profession. Their job touches every different part of a busy veterinary hospital or clinic. 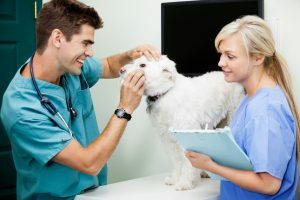 A veterinary assistants perform reception functions, fill prescriptions, keep exam rooms and kennels cleaned and prepped, set up lab work, assist with inventory, update medical records, assist with nursing care, assist with surgical preparation and procedure, and perform radio-graphic procedures. Their assistance provides invaluable help to veterinarians and licensed veterinary technicians. Assist with nursing care and surgical preparation. This program is designed to prepare graduates to pursue entry-level employment in the field, or jobs in related fields, the specific job titles of which may not be represented in the program title or described above. Although the School will assist students with job placement, finding a job is the individual responsibility of the student.